Cambodian Children’s Hospital Benefits In N.Y. & L.A.
New York, N.Y. I have been a friend of Friends Without A Border(FWAB), the international fundraising source of theAngkor Hospital for Children (AHC), for several years. Several of my friends are involved, including Nerou Cheng, Akiko Arai, and Alisa Chazani. The founder of the hospital is New York-based Japanese-American photographer Kenro Izu, a unique thought leader and global citizen. Kenro travels the world capturing sacred ancient stone monuments in their natural settings — Egypt, England, Mexico, Easter Island. And Cambodia. Every year for 13 years Friends Without A Border has held an astonishing auction of fine photographs to fund their project. This year they held a parallel event in Los Angeles on December 10th. The author with founder Kenro Izu, an incredible thought leader and global citizen. This year marked a very special achievement for the Angkor Hospital for Children – ten years of providing compassionate medical care to the children of Cambodia. The brutal Pol Pot Regime, plus years of civil war and foreign occupation have left Cambodia one of the world’s poorest countries. Approximately 34% of Cambodians survive on less than $1US per day. 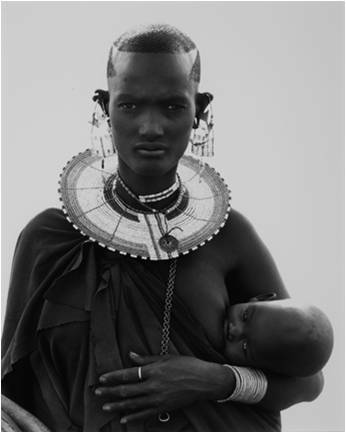 Image by Herb Ritts (titled: Massai Woman and Child, Africa 1993). The Khmer Rouge exterminated — literally exterminated — over 90% of the educated and professional population of Cambodia, leaving the country without the most basic civil support systems, such as teachers, engineers, and medical professionals. My recent HuffPo interview with Cambodian-American former U.S. Ambassador to the United Nations, the Hon. Sichan Siv, who survived the Killing Fields of Cambodia, covers some of this tragic period. Of a population of 13 million, nearly half are under the age of 15. The children always suffer greatest from poverty, contaminated water and a lack of adequate sanitation. More than half of Cambodian children are malnourished and 1 in 15 will die before reaching the age of 5 – many largely due to preventable causes. Hundreds of children arrive at the Angkor Hospital for Children each day. The HIV infection rate in Cambodia is the highest in the region. Many children have lost parents to AIDS and some are infected themselves. Over 750,000 children have received high-quality, comprehensive medical care at AHC. 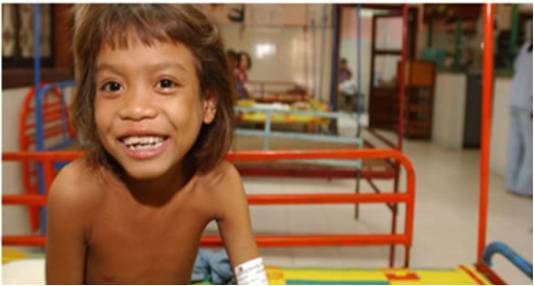 Since its inception in 1999, over 750,000 children have received high-quality, comprehensive medical care at AHC. The reach of the hospital has continued to grow thanks to the success of two innovative programs: the Capacity Building and Health Education Program, delivered directly to local villages. And the now International Medical Education Center. To ensure the continuation of high medical care standards, ACH uses professional lectures and hands-on training, to educate the Cambodian medical staff. These services are provided by highly experienced and skilled physicians and many other essential professional medical staff, who come from all over the world, volunteering their time and expertise. Sale of annual photographic to fund Friends Without A Border’s children’s hospital. In a cynical age, I have stop searching for heroes and saints for beliefs and a happy ending. I now look for the simple man who sees a problem and is inspired to try and fix it. For no other reason than he believes he can. He will try – and he will do his best. Heroes are born in repeated legends. Saints have to die and people in need wait far too long. I was not there when Kenro saw the need. In fact, for the first few years, I was not even aware of his mission. To me, he was just a photographer whose pictures I liked. In the haze of my memory I can’t even remember who suggested that I become involve with Friends for, in my small reality, just getting up to face the world and choosing my tie are great accomplishments. It is about all I do. But to raise funds and build a respected and functioning children hospital half away around the world, to support and sustain it, and then give it away to the people who need it and to do it for nothing — this is a simple man’s vision. To stop others and make them see and wish to share in your vision now that is something to face. And each year, for the past seven, I have decided to share and face this simple good man’s vision too. In my own small way. Why? Because I can’t do big things. But I can help others. Kenro is self effacing, reflective, quiet. This is because he would say he is supported by many simple men and women, to keep an idea, a organic living dream, comprised of many simple people, who serve others alive. That is not a miracle, it is a reality. In our hearts we like to believe that art is worth fighting for, that it can start or stop a war. Show me this. But here is Kenro – a man who has inspired other men with their love of art and each other – to heal the damages of a war that is real. I know good is being done and it gives me great pleasure to introduce one simple and good man, Kenro Izu. Professional auctioneer Rick Wester is a master at raising the bids to benefit children. A lovely and lively cocktail reception preceded the auction, and gave bidders a chance to view the wonderful photographs and lovely photography books. Delicious Asian hors d’oeuvres were served, provided by Restaurant Tokyo and by the catering services of Irene Khin Wong’s Saffron 59. The decor for the event was set by Chazz Levi. In addition, a large team of volunteers helped to make this auction a success. All would not have been possible without the phenomenal planning and organization skills of Akiko Arai, who has worked in the FWAB office and operations from its very inception. She is truly the backbone of FWAB. Three research studies conducted at AHC were selected to be published in international medical journals; and AHC doctors and nurses represented the hospital at conferences worldwide. The Capacity Building and Health Education Program building has been built on AHC ground, allowing for closer collaboration with AHC in providing a preventative approach to healthcare in the rural areas of Cambodia. The medical education programs at AHC continue to thrive. As an officially recognized teaching hospital by the Cambodian Ministry of Health, AHC had educated more than 2,000 healthcare workers last year. The hospital also became a training site for Lao doctors and nurses, developing advanced skills they can take back to their own country. The Center for Friends Without A Border (Friends Center) celebrated its first anniversary this year, and earned two awards for architecture and design. Symbolizing a nexus of caring for the community and ecological sustainability, the Friends Center has served as a comfortable place to welcome visitors and educators from around the world. 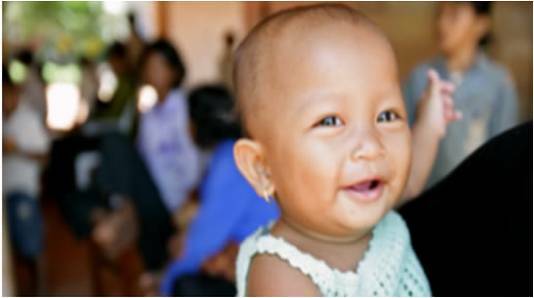 Kenro Izu’s vision of providing quality and compassionate care to the children of Cambodia continues to be realized each and every day at AHC. Over the past sixteen years his vision has grown into Cambodia’s strongest hope for a healthy future. His dream has resonated in the hearts of many in the art community, photographers and others. Their support is what makes the annual Friends of Friends Photography Auction so exciting, so successful. In both New York and Los Angeles, the incredible number of photographers, galleries, and collectors who have donated their artwork for the sake of Cambodian children is amazing. Proceeds from Kenro’s exquisite platinum palladium photography prints – taken with his special custom camera equipment (weighing 200 pounds) – as well as his beautiful book, Light Over Ancient Angkor, are donated to the hospital. 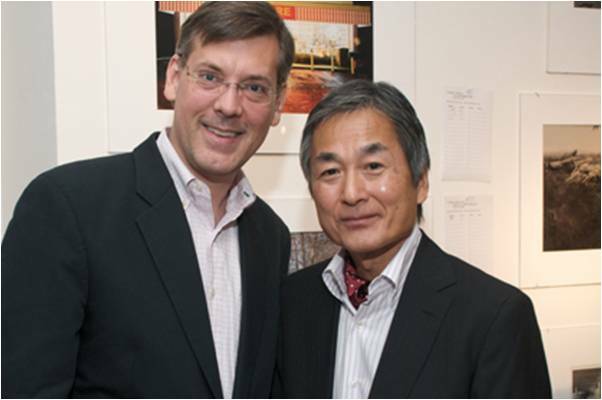 The Howard Greenberg Gallery has represented Kenro since the 1980’s. 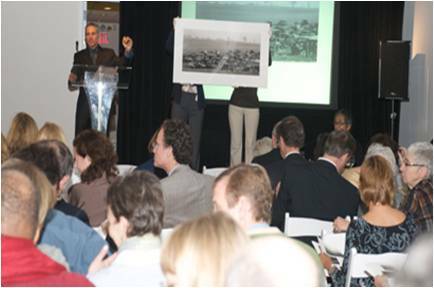 Twenty photos of this auction were donated by the individual artists, courtesy of the Howard Greenberg Gallery. How many of these children will grow up to be the thought leaders and global citizens humanity will need to lead us forward? Far more than would without the life work of Kenro Izu and his dedicated team. Edited by Alisa Chazani and Ethel Grodzins Romm. Originally published in The Huffington Post, December 9, 2009. Originally published in The Huffington Post, December 9, 2009.